Freshly ground spices are key for fresh tasting food. I don’t buy ground nutmeg anymore, and routinely grind my own allspice, cardamom and cumin. I have a mortar and pestle, which served its purpose. For most things, it works quite well. My nemesis were coriander seeds, though, which I learned while making dukkah, a sweet-savoury Egyptian spice blend. Oh my! I never knew such small things could give you such a work-out. This is what prompted me to seek out an alternative for my forearms. The spice grinder has lived up to its potential, and I happily make room for it in my cupboards. So why I am bringing up dukkah? Well, as I try to eat my way through my fridge and pantries before I move, I discovered a small container harbouring some leftover dukkah in my fridge (right next to my rediscovered miso, no less!). A sniff taste told me this was still fresh! Slightly unconventional, but incredibly delicious, this Egyptian spice mix is spiced with cumin, with a citrus overtone from coriander, with sweetness imparted from almonds and coconut. Earlier, I found it scrumptious with a poached egg and toast, but I was eager to try it with roasted vegetables. How do you like to use dukkah? This is my submission to My Kitchen, My World for Egyptian travels and to E.A.T. World for Egypt. 2. If making your dukkah, now, separately toast the almonds, coriander seeds, cumin seeds, sesame seeds and coconut. Grind each individually, then combine all together with a pinch of salt and pepper. Set aside. 3. 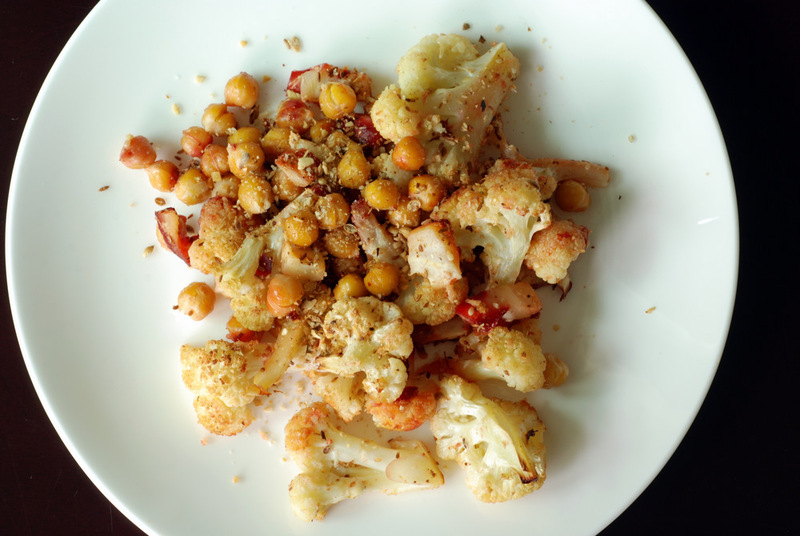 Combine cauliflower florets (include all the little bits!) and chickpeas. Toss with olive oil and salt, to taste. Lay in a single layer on two baking trays lined with a silpat. 4. Roast for 20-40 minutes until top edges are golden brown. Check at 20 minutes, if it isn’t done, toss to have them evenly roast. Once out of the oven, top with dukkah. Serve immediately. Thanks for the dukkah idea, I have never tasted it. Have no fear, Sissi! Ebleskiver pans double as takoyaki pans! And they can be found (cheaply) on Amazon! Thank you for the answer and the link! Unfortunately I think shipping it to Switzerland would double the pan’s price or even worse 😦 but I’ll try looking for it on a European website! Oh, fantastic! I’ve been meaning to find more ways to use my dukkah besides the traditional condiment way and on popcorn! 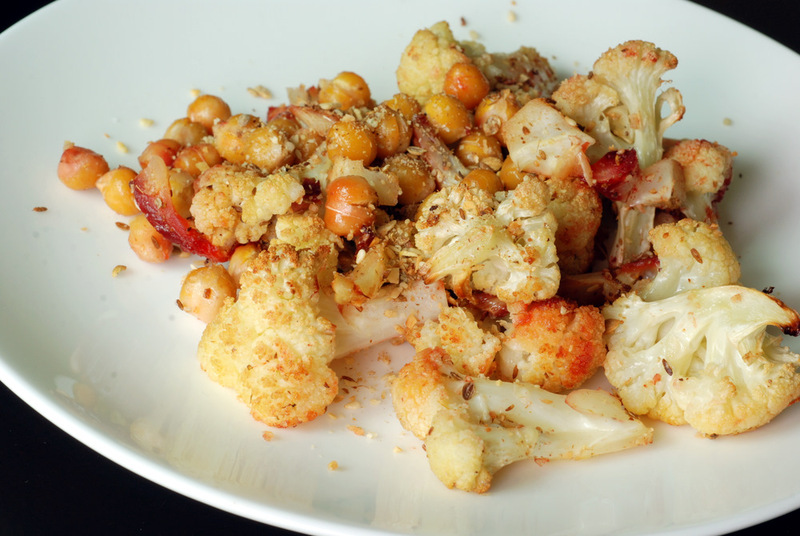 Feel like finishing that roasted cauliflower & chickpeas, very tempting..
Dukkah is one spice blend that my cabinet is sorely lacking in! I too have a coffee grinder that i use for spice grinding…but I also grind coffee beans in it. 😛 Guess I’ll be grinding up some dukkah next! This dish sounds delicious! I’ve never heard of dukka – thanks for introducing me to something new! Sounds right up my alley, too. Janet, the dukkah sounds amazing! I love trying new spice blends, and also have a coffee grinder just for spices 🙂 This whole dish looks like something I’d order at a middle eastern restaurant, just delicious! Thanks for sharing it with MKMW destination Egypt. I’ve never tried dukkah before! I must fix that. 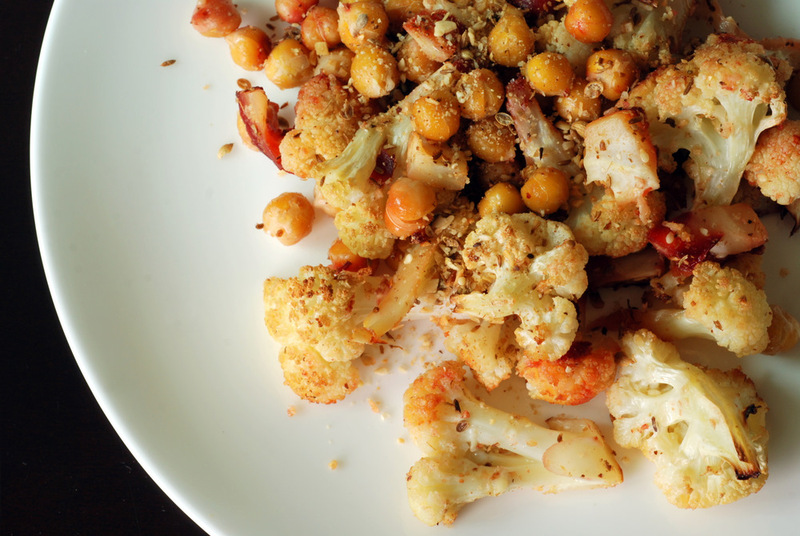 Roasted chickpeas and roasted cauliflower are such a yummy combination. Did I ever tell you about how I am in love with roasted salt and vinegar chickpeas (recipe from oh she glows). Such a delicious crunchy snack! Why two baking trays ? I found everything didn’t fit on one tray. You want them well-spaced out, otherwise they may steam instead of roast. Hope that helps!